Save $10* & Reserve your Appointment Time Today. Book Now! Phone Ninja is happy to provide the highest quality service to our customers in need of a mobile phone, or device repair in Perth. Often, we can provide on the spot repairs, but in order to guarantee that we can repair your phone while you wait, you’ll need to reserve a time slot using our simple online booking system. You only need to provide us with some basic information and choose the time that fits your schedule best. Once we confirm your appointment, we can often perform the repair while you wait. So don’t waste any extra time – when you need professional phone repairs, book ahead of time at Phone Ninja! Please select the store you would like to book below, or email us for a quote. Wait for one of our friendly technicians to confirm your booking & quote via email. Turn up to your appointment on time. If you are early that’s fine, but we may not be able to move onto your phone/device until your allotted appointment time. Enjoy your professionally repaired mobile phone or device. While all care will be given to complete your repair on-the-spot, in some cases unforeseen circumstances may pop up which will require you to leave your phone in the shop for longer or will mean we cannot complete the repair. We have the Right to refuse any booking including but not limited to repairs considered difficult in nature that are not suitable to be repaired on-the-spot, difficulty sourcing parts, busy, low-staffed periods and holidays. 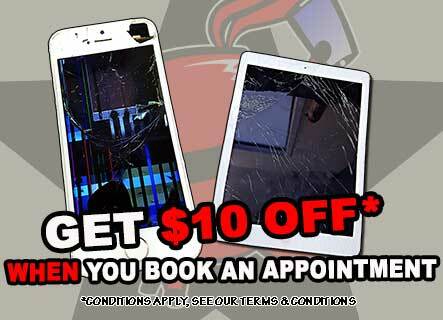 ** *$10 Off Each Job When you Bring in a Friend’s Phone’s or Device. Offer is valid only for December 2018 and can not be used in conjuction with any other discounts inc appointment savings. There is no price limitation for this special.